For the bishop, see Alfonso Guerra (bishop). This name uses Spanish naming customs: the first or paternal family name is Guerra and the second or maternal family name is González. 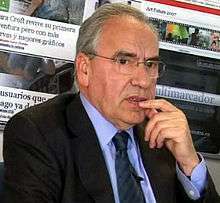 Alfonso Guerra González (born 31 May 1940 in Seville) is a Spanish politician. A leading member of the Spanish Socialist Workers' Party (PSOE), he served as vice president of the government (vicepresidente del Gobierno, i.e., equivalent to deputy prime minister) of Spain from 1982 to 1991, under the premiership of Felipe González. He currently represents Seville province in Congress, being the only deputy that has served since 1977 without interruptions. Guerra was an extremely controversial politician, noted for his acid discourse against his opponents - which was criticised as demagogy by his political adversaries. He was forced to quit his position as vice-president after a financial scandal involving his brother Juan Guerra. ↑ Axel Tschentscher. "Spain Index". ICL. Retrieved 7 July 2013. ↑ "Spain's Leader Feels the Heat From Scandal". The New York Times. 17 September 1990. Retrieved 7 July 2013. ↑ Heywood, Paul (1 October 1995). "Sleaze in Spain". Parliamentary Affairs. Retrieved 7 July 2013.